Think back to a a time you were on an athletic team in gym class, either in high school or college. Envision the determination that pushed you to work your hardest in those moments. Maybe your friend was on the other team and you wanted bragging rights. Maybe you needed to prove to yourself you were strong enough to win. Today, cultivating healthy competition in the workplace can drive business and individual results. Learn how to transform your culture with the incorporation of healthy competition. Without having to create any competition rules or regulations, you can encourage self-competition in the office. Employees can amplify success by trying to beat their yearly numbers from the previous year or from the previous month. If each employee has measurable numbers in a certain time period, it leaves employees determined to surpass their past efforts. In way of recognition, rewards like gift cards and cash can be given to those who have beat themselves with the highest numbers. If your company is not in a position to give monetary awards, a certificate and company-wide recognition can serve as a reward as well. Employees competing on teams against one another is a great way to help foster office relationships. Teams can be formed with employees from all across the company that are working toward a common goal. Even employees that have completely different job descriptions can be placed on teams together. Once you choose teams, inform the company of their teammates and the challenge. Challenges can be anything specific to your business that makes an impact. New calls to prospects and most clients touched are just examples of measurable challenges in the staffing business. These teams will now have to interact and work together to win the competition. This creates a culture of fun around the office as employees have something in common to talk about. At Alliance Search Solutions, healthy competition has been fostered with individual and team competitions. One way we track our goals is with a leaderboard on the wall and some good-natured trash talk! 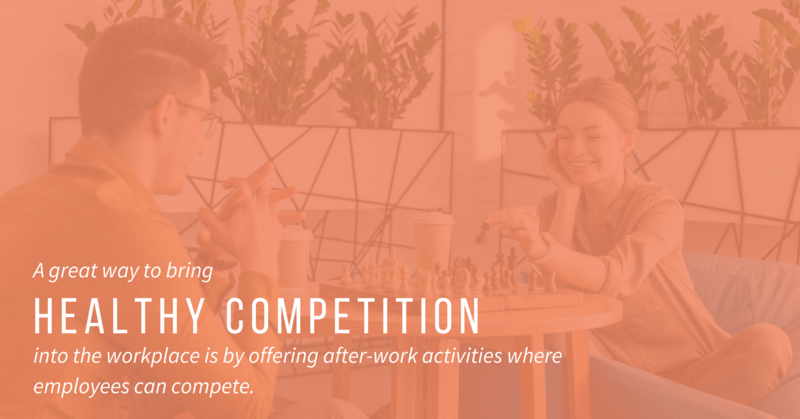 A great way to bring healthy competition into the workplace is by offering after-work activities where employees can compete. 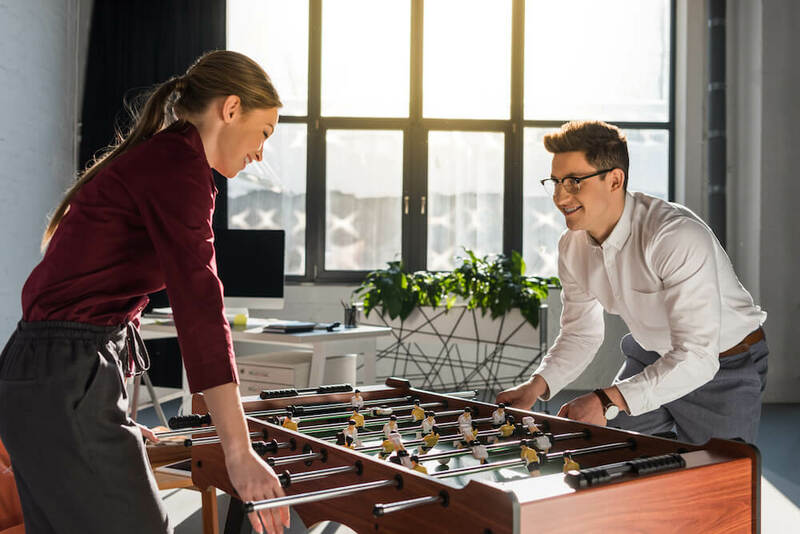 These activities can be things like corporate challenges, where your office is competing against other businesses or competing against others in the office with fun, non-work related activities. When employees interact with coworkers outside of the office in a competitive setting, it can help bring that mentality back to the office the next morning and motivate them to work harder. Pay close attention to how the competition is transforming the work environment. Look at numbers as well as atmosphere. Is the competition inching away from fun and toward unhealthy? Make sure to keep your employees in check and remind them of the true reason for competition – a fun way to boost motivation and morale! If things are getting out of hand and the competition is creating tension in the workplace, consider reworking the competition to loosen the tension and refocus attention to the meaningful results. At Alliance Search Solutions, we believe those that have a passion for winning will work to make it happen. Cultivating the motivation within each individual in the workplace can amount to impactful changes for your business. To learn more about how to grow a healthy, fun corporate culture, download The Ultimate Guide to Corporate Cultures to learn the elements of an awesome corporate culture and how you can bring that to life within your business.